With its winning combination of dramatic chalk cliffs and rolling hills, a coastline dotted with resorts to suit every taste and thousands of acres of open countryside and unspoilt woodland, Sussex is the perfect county to explore with the family. Every gently winding country road or coastal path seems to lead to a new adventure in a county rich with historic buildings, beautifully cultivated public gardens, friendly farms and a multitude of other entertainments just waiting to be discovered. Sussex has so much to offer that it’s hard to narrow down its many attractions, but if it’s a fun day out that can be enjoyed by everyone, here’s our guide to the 10 best family fun days out in Sussex. Set in eighty acres of beautiful Sussex countryside and offering a wealth of fun activities, Knockhatch is sure to be a knockout with kids and adults alike. Take a look at the amazing Bird of Prey Centre and witness wild Peregrine Falcons, owls, vultures and others feeding and taking flight. If it’s animals you’re after Knockhatch has everything from donkeys to wallabies and even a miniature pig called ‘Pepper’. The adventurous will love Knockhatch’s range of crazy and exciting attractions including bungee trampolines, go-karts, a grass toboggan slide, outdoor laser battle area, Quadapillar Barrel Ride and so much more. Knockhatch offers so much fun for everyone that you probably won’t want to leave. Bring your tent and you won’t have to – you can camp onsite! Harking back to a classic era of train travel, the Kent and East Sussex railway winds for more than ten miles through the unspoilt countryside of the Rother Valley between Bodiam, East Sussex and Tenterden in Kent. Climb aboard a classic steam train or diesel locomotive and travel in bygone style on the UK’s finest example of a rural light railway. Depending upon when you visit, you can enjoy a fun day out with Thomas the Tank Engine himself, and the railway also offers spooky Hallowe’en trips and seasonal ‘Santa Specials’. At the Tenterden (Kent) end of the line you can eat at the Station Refreshment Rooms and visit the nearby Colonel Stephens Railway Museum; a tribute to the man who originally built and ran the line. Owned by a real-life friend of Christopher Robin (Milne), Pooh Corner is the gateway to all of the places made famous by Winnie the Pooh and his friends and an unmissable day out for Pooh fanatics young and old. See for yourself the real 100-Acre wood that inspired author A. A. Milne to write about Pooh, Piglet and Tigger’s adventures. You can also visit the actual bridge upon which the game of Poohsticks was invented and play for yourself! Pooh Corner itself is a shop dedicated to all things ‘Winnie the Pooh’ and contains thousands of gifts and souvenirs. More importantly, once you’ve enjoyed refreshments at Piglet’s Tea Room you can pick up a map of the real-life ‘enchanted places’ mentioned in the famous stories and venture out to find them. Roo’s Sandy Pit is here and so is Galleon’s Lap (mentioned at the end of The House at Pooh Corner) but will you be brave enough to seek out the Heffalump Trap? The whole family can get up close and personal with an astonishing and colourful array of exotic butterflies at Earnley’s Butterfly Park and Gardens as these beautiful creatures are apt to land on top your head, your hands and even on your nose! Enter the tropical bird aviary to see parrots, lovebirds, cockatiels, finches, parakeets and others fly freely about you as you walk amongst them. In the rescue centre, Noah’s Ark, the brave can say hello to a selection boa constrictors, pythons and iguanas along with a host of other abandoned and rescued animals including chinchillas, tortoises and rabbits. Anyone nostalgic for the recent past will enjoy ‘Rejectamenta’ an educational and amusing insight to everyday twentieth-century life as demonstrated the products and appliances we used to buy for home and office. A stroll around Earnley’s seventeen themed gardens completes a fascinating and enjoyable family day out in Sussex. Who said museums had to be dull and stuffy? Amberley is an amazing working museum which imaginatively recreates the industrial heritage of southeast England. Here you’ll find a genuine blacksmith, potter, stained glass maker and broom maker all demonstrating their arts in lovingly recreated workshops. A vintage bus service or narrow-gauge railway service transport you around Amberley’s thirty-six acre site which, along with the numerous fascinating workshops, exhibits and vintage shops also offers nature trails to explore and picnic areas for enjoying an alfresco family lunch. From a 1950’s fire station to an old-fashioned rural telephone exchange, Amberley Museum and Heritage Centre makes exploring industrial history an entertaining, educational and fun day out. A zoo with a difference, you won’t find any big cats or elephants at Drusillas Park. The creatures here might be smaller in stature but they’re no less interesting, which means that visitors can enjoy encounters with the likes of marmosets, lemurs, capybara, gibbons and meerkats. Probably best not to get too close to the Mexican red-kneed tarantula though. Elsewhere there are outdoor adventure areas for kids such as the Eden’s Eye interactive maze with surprises at every turn, Go Bananas, a crazy jungle-themed playground for the under-sixes and it’s big brother Go Wild for older kids. Indoors there’s a three hundred square-metre soft play area called Amazon Adventure with enough running, jumping, climbing and sliding activities to keep everyone happy. Around the park you can go fossil-hunting or gold-panning for fun, be a hot shot at the shooting gallery or try a round of jungle golf. True zoo devotees can even become a Drusillas zookeeper for a day! Although Tulley’s Farm Fun Park is world famous for its maize maze, there are plenty of other activities to keep the family amused on a day out here. Agricultural golf is crazy golf on a farmyard-sized scale, and there’s also the intriguing ten-hole ‘Frisbee golf’ to try. Kids will love the straw mountain, inflatables and mini-mazes and you can tour the farm on a tractor. Tulley’s farm itself offers a range of fresh produce to buy from its farm shop and a tea room and espresso bar in which adults can recover from the exertions of the fun park. Although the estate is seven hundred years old, the current presentation of Bentley House and gardens dates back to 1937 and since that time the estate has been expanded to provide a range of activities for all the family to enjoy. Bentley House has been beautifully renovated with period décor and antique furniture and the gardens provide an immaculate showcase for rare trees and plants. The motor museum houses a fascinating range of vehicles of every era from vintage to modern, each in pristine showroom condition and –inevitably – includes a Bentley from 1937. Bentley’s wildfowl reserve covers 23 acres and is home to an impressive 125 of the estimated 147 species of wildfowl found worldwide. A miniature train covers the distance to 12 acres of woodland which can be explored along a circular footpath. Kids will love the adventure playground with its tree platforms and rope bridges, and the estate’s tea rooms provide an excellent spot to enjoy a cream tea to round off an exciting day. 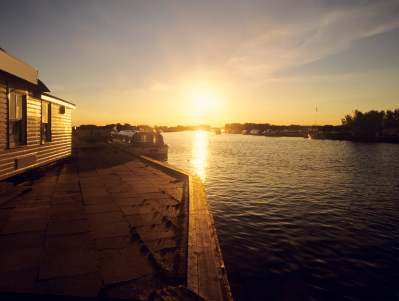 Exploring the historic cathedral city of Chichester makes an entertaining family day out in its own right, but Chichester’s large natural harbour is something special. The systems of mudflats, marshes and wetlands surrounding the harbour have been designated an area of Special Scientific Interest thanks to the proliferation of different wildfowl species found here. Wildlife lovers who enjoy walking will love exploring some of the ninety kilometres of paths surrounding the harbour, some following the shoreline and giving outstanding views of the Solent, others leading to the charming harbour side villages such as Nutbourne and Langworth. There are shorter pushchair friendly routes which offer the best views of the water as well as idyllic spots to enjoy a family picnic. For those who prefer to be on the water rather than beside it, there are numerous opportunities to take a sailing trip along the harbour’s 48 miles of diverse shoreline. Available vessels range from a traditional oyster boat to a retired lifeboat and to a virtually silent solar powered catamaran, so there should be something to suit sea legs of every age. Post by Andrew for Elite Hotels who run 2 luxury hotels in East Sussex at Ashdown park and the Grand Hotel in Eastbourne, East Sussex. » » Sussex: A County of Battles and Beauty, Invasions and Inspirations » Slices of Life!